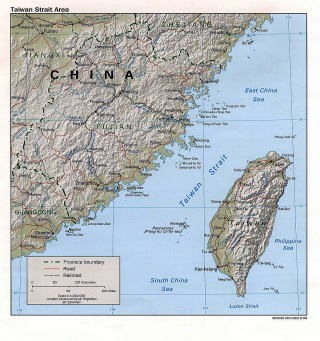 The Dongshan Islands are in the southern part of Fujian Province, to the south of the west coast of the Strait of Taiwan (longitude 117o17′33″ E, latitude 23o33' 33'' ~ 47' 11'' N). There are 44 islands altogether in the county. The total area of the major islands is 194km2, and the population is 200,000. There are 7 Chin (equivalent to Japanese towns), a nationally-owned forest and an economic and technological development district. The total GDP of islands in 2003 was 3.62 billion yuan. The main industries are fishery, fish farming and asparagus farming; recently, tourism based as resort development has been growing quickly. The climate of the Dongshan Islands is influenced by the South Asian tropical monsoon: in winter, north-east winds, and in summer south-east winds prevail. The annual average temperature is 20.8 Centigrade. The coldest month of the year is February with an average temperature of 12.9 Centigrade; the hottest, July, with an average temperature of 27.3 Centigrade. They have warm winters, cool summers, and no frost throughout the year. The annual average rainfall is only 1103.8mm, which causes a shortage of fresh water. Extra water must be brought in from outside for both domestic and industrial use. Before 1949, Dongshan county had a total forest area of only 147 Mu (1 Mu =9.8ha) out of its total area of 194km2. 35,000 Mu of the sand beach along the south-east coast was barren. Strong winds during the winter cause sand to be blown into the air and pebbles to be moved. 43 moving sand dunes then threaten the croplands and villages. Over the last 100 years, wind and sand storms in Dongshan have buried 11 villages, more than 1,000 buildings and more than 30,000 Mu of croplands. Villagers’ suffering from desertification and drought was enormous. 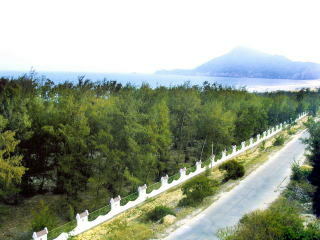 After the People's Republic of China was founded, Dongshan local government established the simple principles of sustainable development for rehabilitating the ecosystem, based on the understanding that the severely deteriorated ecosystem and environment are the biggest bottleneck of economic growth in Dongshan. The local authority called out to people, 'Let us fight against the bare mountains and flying sands; let us make the whole islands green, and create a new Dongshan'. Then the planting of trees was implemented, mobilizing the entire county population. By December 1958, trees had been planted in 3,000 Mu of mountain waste land and 27,000 Mu of sand beach. Even for the mobile sand dunes, grass was planted in 5,000 Mu. 80% of the mobile sand dunes were stabilized through afforestation with 1.53 million trees. Currently Dongshan has a forested area of 108,000 Mu. 32.7% of the total area of the county is covered with forest, and the greenery ratio is 98%. The increase of forest land has reduced the wind power by 41-61%, increased the winter temperature by 1.5 Centigrade, decreased the evaporation by 22% and increased the relative humidity by 10 - 15%. For such a successful result, Dongshan was designated as the national pilot district for sustainable development. Despite the achievements of the plantation project, recently, problems which could not be ignored have emerged. To address these problems, Dongshan county government has established some operational principles for forest development. Both problems and countermeasures are shown below. (i) It is difficult to plant trees in those small areas which function as wind passages. Because not many trees can survive, in some parts, the windbreak has gaps. More trees should be replanted. Some of the cropland should be left fallow, and during this period, trees to serve as ‘foundational forest’ will be planted. (ii) The first-generation foundational forests have already been badly damaged. The second-generation trees, although able to survive, have proved incapable of sustaining a self-regenerating forest. The quality of individual trees is low. The cropland and forest network should be renewed, rehabilitated and improved. In conjunction with the implementation of the Plains Greening Model County activities, plans to restore cropland to forest should be examined. (iii) Densely populated areas on the coast have a shortage of cropland, which makes it difficult to secure the land for windbreak tree plantation. Windbreaks should be developed as part of the establishment of the national forest reserves. Following the overall plans for the Dongshan National Forest Park, the infrastructure in the forest reserves should be upgraded. (iv) Greening along the roads or in villages and towns remains at a low level. The principle of reserving 30% of newly developed areas for greening, and 25% of residential redevelopment sites, should be strictly followed. Town and village greening strategies should be examined, to ensure that sufficient green areas are provided. (v) Tree plantation has not been incorporated into traditional forestry or the promotion of tourism business. Because of its geographical and geological conditions, Dongshan has great potential to utilize wind power. In 1997, the 'Wind Power Generation Company of Dongshan County in Fujian Province' was established by a consortium of companies in Fujian Province and Dongshan County, and 10 wind-power generators were bought through a loan of about 4 million dollars from Spain. Wind-generated power began to be used in October 2000. For three years between 2001 and 2003, the electricity generated by wind reached 11 million kW, which is 6.1% of the annual electricity use in Dongshan. In 10 years time, the initial expenses will be paid off. Further survey after the success of this project has revealed more potential sites for wind power generation in Dongshan. New projects are being prepared and overseas cooperation is being sought. In the past, the wild wind brought only misery to the residents, in the form of flying sand and pebbles, but now, it carries the benefits of green energy to people living in Dongshan.